it was in austria when i ate the first time a salad with kaeferbohnen and i loved it so much that we bought some in the garden center to grow them on our own. i don´t know why but you can´t buy them everywhere in austria and even less in germany, not even in organic food stores. but as i had fallen in love with that salad it became a necessity that we had to grow them ourselves. well, before i never had grown beans to dry and store. it was obvious to me that we should wait for harvesting them until they would be mellow. but then? it was not so easy to find some information, as it is so self-evident that no one had the idea to write it down. even my parents had only vague childhood memories on that. so we sowed them out as usual and then let things go. 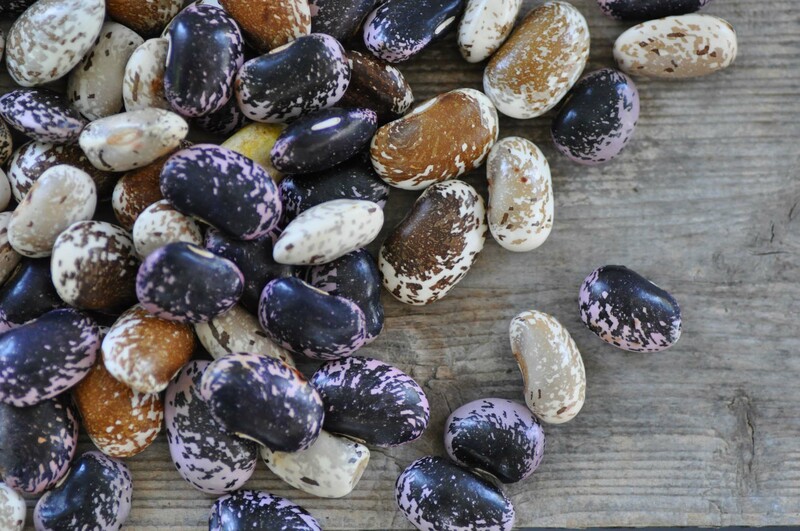 we ignored the kaeferbohnen during the whole summer as we did with all the other beans which became too big to eat them fresh. it was already october when we harvested the beans. some of the shoots already dried during summer. so we podded them and laid the beans out to dry completely. all the other shoots, still a bit soft or new, we left on the plant and hang the whole plants on a dry place to allow to dry out completely. in january we podded all the remaining beans, spread them out and allowed to dry on a warm place before we stored them in jars. now i am looking forward to my own austrian keaferbohnen salad! This entry was posted in autumn, gardening, spring and tagged beans, kaeferbohnen by The Cook. Bookmark the permalink. We grew Kaeferbohnen also known as Kastanienbohnen in Canada for more than 40 Years and we were always lucky to harvest a great crop. It must be mentioned though: you need to put them in early in the spring because they have a much longer growing season than other pol beans. They do need a lot of sun and good growing medium. We always made sure that we used Epsom salt sparingly, but bone meal generously. When you want them ripened on the pole, make sure you cut the bean stalk on the bottom but leave the pole alone if the weather seems to be holding up/out – otherwise bring them in a dry place in the barn or other area of your property where they are out of the elements.